Ok, here are a couple of more evenings of progress behind me. 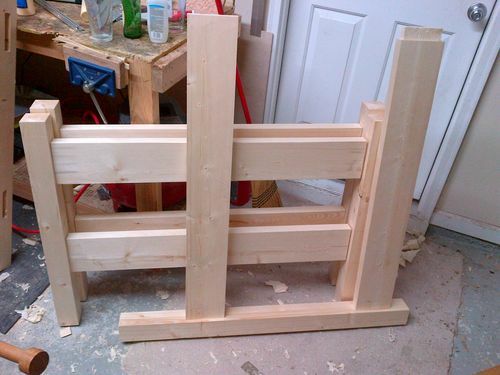 I need to cut 16 tenons total to fit the head board and foot boards on the two beds. This part of the project is going a little slower than the earlier parts. But I’m having fun on this part so its all good. 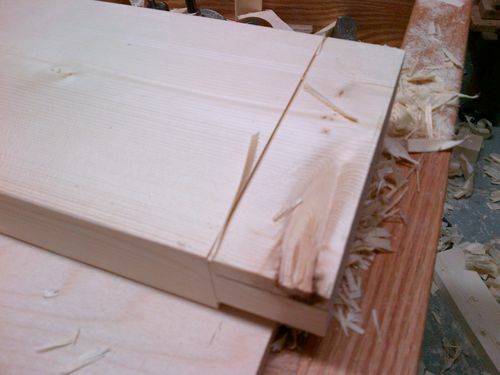 I first scribed a line all the way around the shoulder with a knife, then cut the v groove to guide my saw. 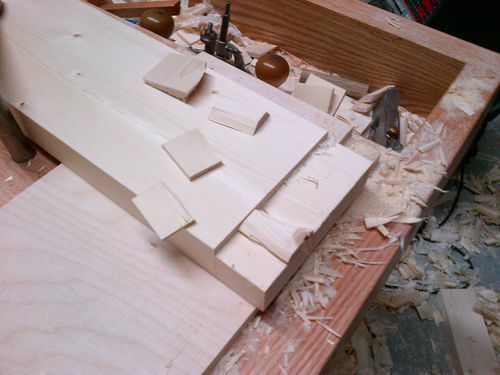 Sawed the shoulder, with my dovetail saw. I tried Paul Sellers advise here and used this saw even though it is a rip saw. I can confirm that a fine toothed rip saw does quite nicely across the grain when you scribe the line first. No tear out and it cut fast. I have a cross cut carcass saw but I wanted to give my new saw a good workout. I thought it worked better than the cross cut saw but then that might mean my other saw needs a fresh sharpening. Next to cut the cheeks. I tried to use my tenon saw but it wasn’t cutting well, again it needs to be sharpened, I just got my files today but in the mean time I used the splitting technique which goes pretty fast once you get a rhythm going. However it’s a little more difficult when you have a knot in the way. Clean up with the #71. 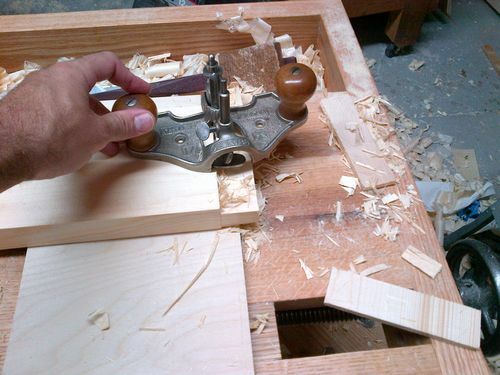 I love my router plane. Just got some new irons from Veritas today which I cant wait to try out on the next few tenons. And that’s where I left off last night. 11 tenons down and 5 to go. Awesome job Maur and if you need any blotching techniques just let me know, I got you. 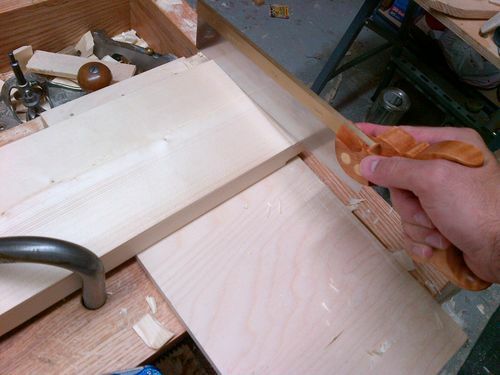 Those are some big tenons, nice work! I have the two (V and Straight) 1/2” router plane irons from LV, and they work great. I just bought the 1/4” and an 1/8” from them as well… can’t wait. LOL. Thanks Stef, the 3yr old falls out of the toddler bed even with a railing so we know who gets the bottom. The wife loves blotch so I will have to hit you up for that advice! lol. My mother in law says, “dont you have a machine for that?” I’m like yeah but it’s a crappy Ryobi TS and these things are too big to balance on there. Much cleaner and predictable results by hand. It may be a little slower but there are fewer mistakes! Great progress Mauricio. That’s a lot of tenons bro. I think you’ll be tucking them into their respective bunks in no time. Are you making a ladder for the top bunk? Maur, any trouble with the LV irons lining up correctly ? Sharpened my Stanley cutters and had to redo by sharpening them in place. Dont let me ruin your English Andy! Thanks bro, yes, I will need a ladder; I actually was just looking for hardware on Amazon just now. I just got the stretcher hardware in from Lee Valley today. Took advantage of the free shipping along with a few other goodies. Kevin, I havent tried them out yet. Hopefully not. I’ll let you know. Manly stuff taking place here! Racking up the galoot points, I see. Good progress, Mauricio. Hey does anyone know where I can get metal hooks to hang the ladder and guard rail? The ones Rockler sells are for 3/4” stock, I need some that will work on 1.5” stock. Can I make my own from flat bar stock? Can I just bend it to shape? Should I heat it before bending? Nice progress. If Stefs in the top bunk I feel sorry for the one in the bottom! !